In the 1980s and 1990s, Cuba implemented a series of reforms to attract remittances from abroad. These policies included efforts to attract foreign investment (1982, 1995), the expansion of international tourism (1990), the authorization of some (limited) forms of self-employment (1993), the semi-official “dollarization” of the Cuban economy (1993), the reorganization of the agricultural sector (1993, 1994), the expansion of the national network of retail “dollar stores” (1995), and the modernization and transformation of the banking and financial sectors (1997). Officially, the need for modernization and improved efficiency were cited as the principal reasons for the transformation of the banking and financial sectors and the monetary changes that followed. However, given the external dependency of the Cuban economy, and the growing importance of remittances, it appears that these policy measures were also motivated by the imperative to attract remittances from abroad. Despite Cuba’s initial success in attracting remittances, some of the monetary reforms of the 1990s were reversed in 2003. As in the past, the Cuban leadership justified monetary policy changes because of external factors1 and political considerations.2 Starting in 2003, Cuba effectively reversed its previous attempt to adopt quasi-official dollarization of the economy by recentralizing all foreign exchange operations, replacing the U.S. dollar (USD) with the convertible peso (peso convertible) (CUC), and limiting the dollar’s circulation (or its function as a medium of exchange and unit of account). This time, however, success appears to be less certain and there are indications that a change of course may soon be underway. This paper examines Cuba’s banking sector and monetary reforms during the 1990s, and analyzes some of the principal policies implemented by the Cuban leadership to attract remittances. I then examine the relationship between these policies and the influx of remittances to the island. This analysis is followed by an overview of recent monetary changes and their (potential) impact on remittances and international tourism. Cuba experienced the most severe economic crisis in its recent history in the early 1990s. While the principal causes of this crisis are well documented (Mesa- Lago, 1993; Jatar Hausman, 1999; Ritter, 2004; Mesa- Lago & Pérez-López, 2005), a brief review highlights the principal reasons for the transformation of Cuba’s banking and financial sectors and the monetary reforms that followed. On the domestic front, the Cuban economy suffered a severe output decline, which was primarily attributed to structural rigidity, falling labor productivity, declining international competitiveness, and high levels of inefficiency (Mesa- Lago, 1993). 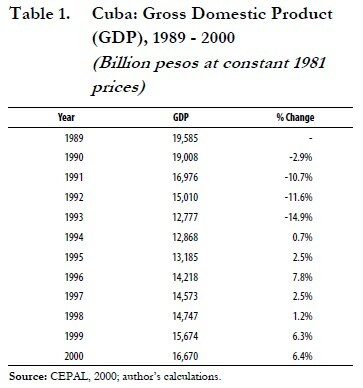 Between 1989 and 1993, Cuban gross domestic product (GDP) declined 34.8% (Table 1). After touching bottom in 1993, the value of the goods and services produced by the Cuban economy began to recover gradually. Between 1994 and 2000, GDP increased 29.5%, reflecting an average annual growth rate of 4.9%. 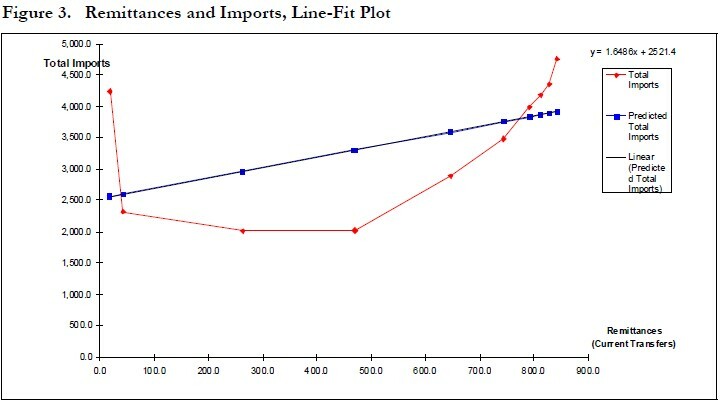 On the external front, the crisis was exacerbated by growing trade deficits (Table 2 and Figure 1), the loss of preferential prices and markets for Cuban imports, declining international competitiveness, and mounting external debt.3 Cuba’s export capacity declined significantly during the worst years of the crisis (Table 2). Merchandise exports fell 79.6% from 5.4 billion pesos in 1990 to 1.1 billion pesos in 1993. The island’s export/import ratio (EX/IM), a commonly- used measure of a country’s ability to use exports to finance its imports, decreased from 0.73 in 1990 to 0.58 in 1993, while its trade openness index (TOI), which measures the economy’s “openness” to international trade (e.g., the ratio of total trade (EX + IM) to GDP), fell from 0.65 to 0.24 during the same period. 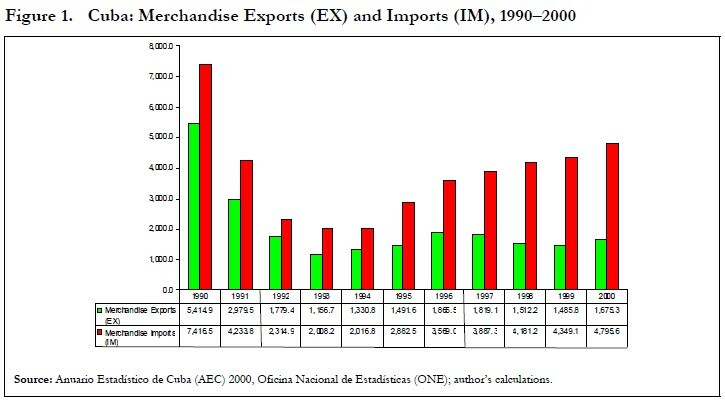 Even though exports began to recover gradually starting in 1994, they grew at a slower pace than imports, and Cuba was forced to rely on high-interest, short-term, loans to finance a growing share of its imported goods. 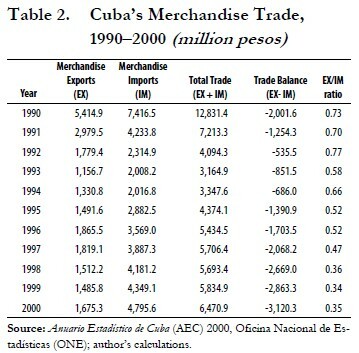 Between 1994 and 2000, Cuba’s merchandise exports grew 20.6%, while imports increased 137.8% during the same period. As a result, the export/import ratio declined 46.9%, from 0.66 in 1994 to 0.35 in 2000. Given the multidimensional magnitude of the crisis, the modernization and transformation of Cuba’s banking sector during the 1990s was one of the most notable policy measures to confront the economic crisis and attract remittances from abroad. This process was initiated by Decree Law No. 172 in 1997, which replaced the country’s Central Bank (Banco Nacional de Cuba—BNC) with a newly created institution, the Banco Central de Cuba (BCC) (“Decree Law No. 172,” 1997). According to Decree Law No. 172, the BCC functions as the principal regulator of depository and non-depository financial institutions, prints (emits) currency, establishes interest rates and monetary policy, serves as a “lender of last resort,” and acts as fiscal agent for the State (“Decree Law No. 172,” 1997). In order to diversify, expand, and modernize Cuba’s banking sector, the Council of Ministers approved Decree Law No. 173 in September 1997. The approval of this law created a two-tiered banking system comprised of the Central Bank (BCC) and a series of existing and newly-created banking and nonbanking institutions. According to the BCC, in addition to the Central Bank (BCC), Cuba’s banking and financial sector currently consists of 8 commercial banks, 21 non-bank financial institutions, and 11 foreign- operated “representative branches” (“Banco Central de Cuba,” (2007). The transformation of the banking and financial sectors in 1997 expanded Cuba’s ability to conduct monetary policy. However, due to the country’s centrally- planned economic system, the conduct of monetary policy is limited to two basic tools: (1) interest rates, and (2) reserve requirements. Interest rate ceilings are established and monitored by the BCC’s Monetary Policy Committee (Comité de Política Monetaria—CPM), which was created in 1998. The MPC is also responsible for regulating foreign exchange transactions, monitoring trends in monetary circulation, and formulating and implementing policy responses to changes in monetary overhang or excess liquidity (BCC, 1997). Although it takes a proactive role when performing its other vital functions, the MPC has been particularly involved in addressing monetary overhang —the value of cumulative excess money in circulation and bank deposits—in the Cuban economy. At the onset of the “Special Period” in 1990, monetary overhang represented 23.9% of GDP; by 2003, it reached 66.5%, representing an increase of 178.2% during this period (Barberia, 2002). To reduce excess liquidity and encourage the population’s participation in the banking system, Cuban government embarked on a two-pronged approached. The first component of this strategy was designed to provide incentives to increase the public’s participation in the banking system. And the second consisted of the introduction of domestic convertibility by creating a new currency, the convertible peso (CUC). To accomplish the first objective, the MPC established a 5% interest rate ceiling for peso-denominated short-term and medium-term deposits, and a ceiling of 7% for instruments with longer maturities.4 Depository institutions were given a “flexibility band” of +/ – 2% from the established interest rate caps to attract new peso and USD deposits (BCC, 2007). In addition, the following (fixed) annual rates were established for personal installment loans: (1) consumer loans (8%); (2) home improvement loans (9%); and (3) cash loans (or cash advances) (9%) (BCC, 2007). The BCC also established the following minimum reserve requirements for depository institutions: (1) deposits in Cuban pesos (CUP) (10%); and (2) deposits in USD (5.5%) (BCC, 2007). To accomplish the second objective, the Cuban government introduced a new currency, the convertible peso (CUC) in 1994. By introducing the convertible peso, the Cuban government was able to increase its borrowing capabilities by trading foreign exchange for Cuban government paper, which was anchored to the U.S. dollar (Barberia, 2002). In addition, the introduction of the convertible peso stabilized exchange rates. After suffering a severe depreciation during the worst years of the economic crisis of the 1990s (1990–1993), the extra-official Cuban peso/ US dollar (USD) exchange rate improved from an average of 96 pesos per dollar in 1994 to 21 pesos per dollar in 2000 (Barberia, 2002). Prior to the transformation of the banking and financial sectors, the Cuban leadership implemented a series of reform measures in response to the economic crisis of the 1990s. The most notable of these policy measures included efforts to attract foreign investment, the expansion of international tourism, the legalization of limited forms of self-employment, the reorganization of the agricultural sector, and the expansion of existing food and consumer goods outlets such as the agricultural markets and the “dollar stores.” Although not originally intended to influence remittances directly, these measures helped the Cuban government achieve one of its most important objectives: transform some areas of the economy in response to the economic crisis, while retaining political control. Limited forms of self-employment begun in 1993 marked another policy measure implemented to (indirectly) attract remittances. These remittances were particularly useful in areas such as food preparation and distribution (paladares and puestos gastronómicos), transportation, and rental housing. As Table 5 shows, registered (i.e., legal) self-employed workers represented an average 3.6% of the total employed workers (or persons of working age actively employed) during the 1995–2000 period. As Ritter (2004) indicates, the relatively small proportion of registered self-employed workers in relation to total employed workers was mainly the result of an onerous tax structure, existing restrictions on firm size and sources of inputs, and the limited availability of credit and other means of financing. Table 5 further shows that, that despite representing a relatively small share of the total work force, registered self-employed workers carried a disproportionately large tax burden. Between 1996 and 2000, personal income taxes paid by registered self-employed workers—never more than 2% of the economically active labor force—represented an average 66.1% of the total personal income taxes collected by the State. Table 7 shows that Cuba’s food and beverage imports reached an estimated $831 in 1990 but then fell 43% to $474.4 million in 1993, the worst year of the crisis. However, they recovered during the second half of the 1990s. In 2000, Cuba’s total expenditures on food and beverage imports reached $688.5 million, representing a 45.1% increase over 1993. Food and beverage imports represented an average 19% of total imports during the 1990–2000 period. Cuba spent an average of $655.8 million per year on imports of food, and $10.9 million on beverage imports during this period. I conducted several one-variable, linear, regressions to analyze the relationship between remittances and several economic indicators related to the policies discussed in the previous section. This section describes the variables used in the analysis, the rationale for their use, and the results of the regression estimates. I used official Cuban estimates of net current transfers as a proxy for remittances. The estimates for net current transfers were obtained from the balance of payments (BOP) accounts published by ONE in the Anuario Estadístico de Cuba (AEC) in 2000. While I agree with other analysts (e.g., Betancourt, 2000; Morris, 2000; Pérez-López & Díaz-Briquets, 2006) that net current transfers include other flows besides remittances, I used net current transfers as a proxy for actual remittances due to the inexistence of comprehensive survey data to estimate remittances, and other (well documented) difficulties associated with obtaining consistent and reliable estimates of annual remittances to Cuba. Imports: During the 1990s, the growing influx of remittances, combined with the expansion of the outlets for selling food products and consumer goods and the legalization of the USD, contributed to increases in household expenditures and sales in both the “peso” and “dollar” sectors. However, as a result of the crisis, and the difficulties confronting its economy, Cuba continued to rely on imports to meet a growing share of its consumption needs. Therefore, given the role of remittances as a supplemental source of household income, one would expect a positive correlation between imports and these unilateral transfers of private capital. Sales at the “Dollar Stores”: As Table 7 demonstrates, sales in the “dollar stores” increased significantly during the 1990s. Since a significant portion of household expenditures in the “dollar stores” came from remittances, we would expect strong linkages between these expenditures and the influx of remittances. Official Cuban statistics indicate that as a result of these measures, the earnings (or income) of the principal suppliers of the country’s multi-tiered food market increased significantly during the 1990s. 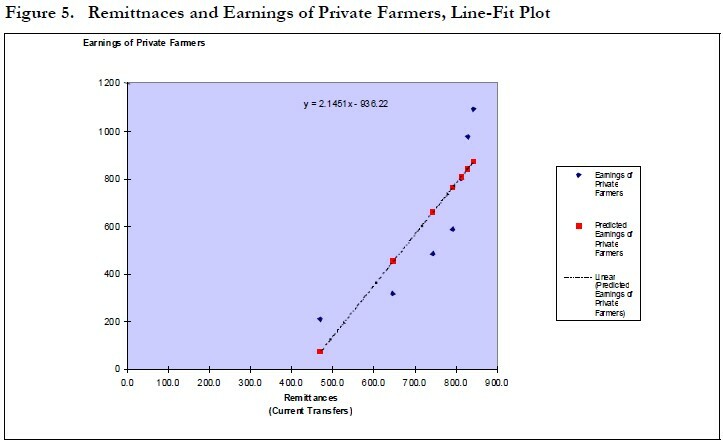 Given the connection between remittances and household consumption, particularly in the case of indispensable foods and food-related products, one would expect a positive correlation between remittances and the earnings of the principal suppliers of these products, including cooperativistas and private farmers. Value of Personal Services: This aggregate measure of the value of household expenditures on personal services includes expenditures by the population on the services offered by barbershops, hairdressers, and photo studios, and rental housing (ONE, 2000). Since some service providers (other than rental housing) offering these services operated in the “dollar sector,” and these expenditures represent household outlays tied to consumption, the correlation between remittances and the value of these services should be positive. Sales Revenues Collected by the State: This aggregate measure of sales tax receipts includes all types of taxes collected by the State from sales and sales-related transactions (ONE, 2000). Estimates include tax revenues generated by sales in both the “peso” and “dollar” sectors (ONE, 2000), and serve as a proxy to measure (or estimate) the relationship between remittances and total sales of goods and services. 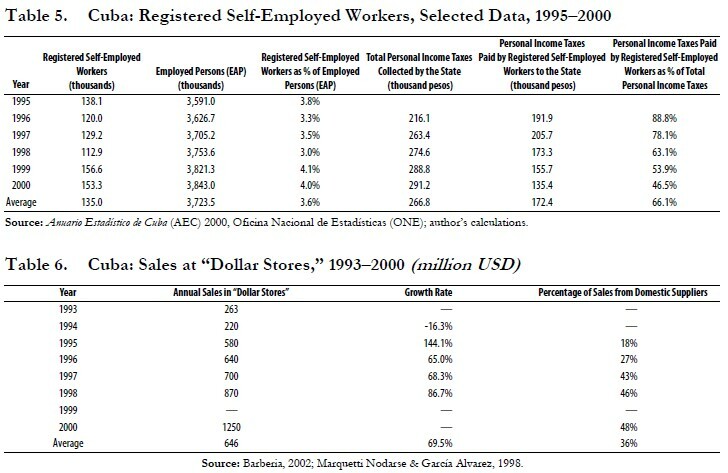 Personal Income Taxes Paid by Registered Self- Employed Workers: During the 1990s, many of Cuba’s registered self-employed workers typically offered their services in both the “peso” and the “dollar” sectors, and the majority of their customers received remittances on a regular basis, suggesting the possibility of a positive correlation between remittances and the gross revenues earned by these workers. Since tax receipts depend on gross sales revenues, and the Cuban government does not publish statistics on the revenues earned by these workers, the personal income taxes paid by registered self-employed workers serve as a proxy to estimate the relationship between remittances and the gross revenues received by Cuba’s self-employed workers. 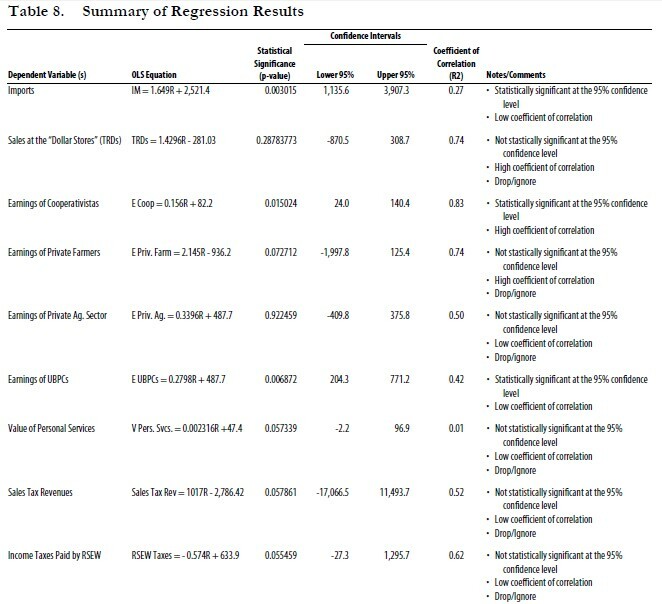 Out of the nine (9) dependent variables included in the analysis, I only found three (3) that were statistically significant at the 95% confidence level (Table 8). These were: (1) imports; (2) the earnings of cooperativistas; and (3) the earnings of the UBPCs. Figures 3, 4, and 5 show the graphs of the line-fit plots (or “ordinary least squares” graphs) between remittances and these variables. Despite Cuba’s initial success in attracting remittances, the monetary policies of the 1990s were reversed in 2003. 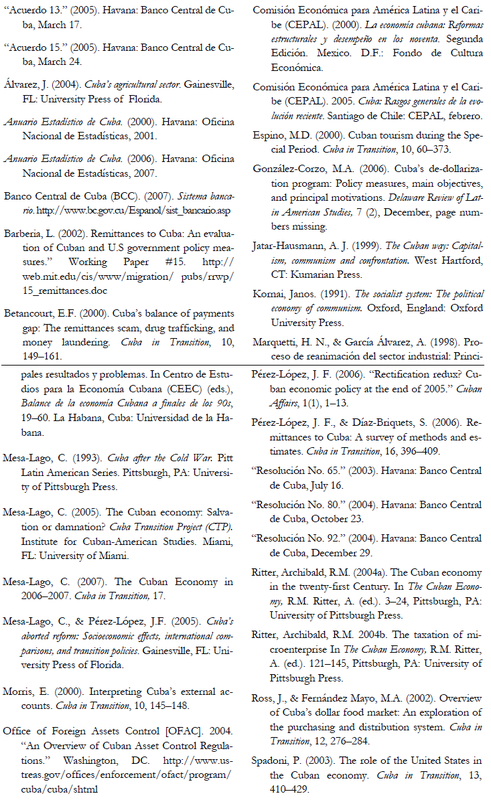 Although official sources attributed these policy changes to external factors such as increased U.S. hostility, the “risks” associated with holding and conducting transactions in USDs, and the need to regain Cuba’s “monetary sovereignty,” worsening economic conditions appeared to have placed a critical role as the principal catalyst behind these policy changes (Mesa-Lago, 2005; González-Corzo, 2006). On July 16, 2003, the BCC approved Resolution No. 65. This policy measure replaced the USD with the convertible peso (CUC) in all commercial transactions taking place within Cuban territory (“Resolución No. 65,” 2003). It also required all Cuban enterprises to convert any excess USD holdings to CUC at the official exchange rate, and required stateowned enterprises (SOEs) to pay the BCC a “foreign exchange servicing fee” ranging from 1% to 2% of the value of any foreign exchange transactions (“Resolución No. 65,” 2003). The “de-dollarization” of the Cuban economy was accelerated with the approval of Resolution No. 80 on October 23, 2004. Although Resolution 80 does not explicitly prohibit the possession of USD by the population, it replaced the greenback with the convertible peso in all retail transactions, and imposed a 10% levy (gravamen) on all purchases of CUC using either USDs or “old Cuban pesos” (CUPs) (“Resolución No. 80,” 2004). Finally, even though Resolution 80 exempts withdrawals from existing USD denominated bank accounts from the 10% levy, deposits of USDs are no longer accepted by Cuban banks (“Resolución No. 80,” 2004). Cuba’s “de-dollarization program” was intensified after the approval of Resolution No. 92, on December 29, 2004, and Agreements 13 and 15 on March 17 and March 24, 2005, respectively. Resolution 92 centralized all foreign exchange operations at the BCC (“Resolución No. 92,” 2004); Agreement 13 established a new CUP/CUC exchange rate of 24 CUP/1CUC for sales of CUC to CADECA and 25 CUP/CUC for purchases of CUC from CADECA (“Acuerdo No. 13,” 2005); and Agreement 15 increased the value of the CUC with respect to the USD by 8% by changing the official exchange rate between the two currencies from parity to 1 USD=0.92 CUC (“Acuerdo No. 15,” 2005). There are conflicting views with respect to the impact of Cuba’s recent monetary measures on remittances and tourism. In the case of remittances, some analysts and scholars believe that remittances will remain mostly unaffected, and could even increase over time because the majority of remitters are believed to be motivated by “altruistic considerations” (i.e., humanitarian concerns for the welfare of close friends and relatives), moral obligations (i.e., familial expectations regarding the “right”—or entitlement —to receive remittances), and the counter cyclical nature of remittances with respect to economic conditions in the country of destination. According to this view, Cuba’s recent monetary changes may cause remittances to increase in the long-run, if senders, motivated by altruistic considerations and their moral obligation to send remittances, are also willing to compensate the reduced purchasing power of their USD remittances (caused by the devaluation of the USD with respect to the CUC) and recent price increases in the farmers’ markets and the “dollar stores” by sending more remittances. In general, I would agree with the first group. The monetary (or foreign exchange) policies implemented in Cuba since 2003 have reduced the purchasing power of those receiving remittances on a regular basis (some 60% of the population), but have failed to eliminate monetary dualism. Even though the U.S. dollar is no longer accepted at the “dollar stores” and other “hard currency establishments” (e.g., bars, gas stations, restaurants, etc.) monetary unification remains elusive. Ordinary Cubans still operate in two parallel, but separate, economies or economic systems. The first, commonly known as the “peso economy” is characterized by what Kornai (1991) defined as a centralized planning structure (or bureaucracy), in which the State plays a central role as the principal coordinator and regulator of economic activity, and in which rationing, price control, and subsidies are used to achieve a variety of economic and political aims. The second sector, normally referred to as the “dollar sector,” but more accurately described as the “hard currency sector,” given recent changes in monetary and foreign exchange policies, features a complex network of distributors and suppliers, which, along with their foreign partners, offer a wide range of domestic and imported goods and services in CUC to the general population. Given the difficulties confronted by the “peso sector,” the majority of Cubans still rely on the parallel and underground economies to satisfy a significant share of their daily consumption. Since at the present time it estimated that at least 60% of the Cuban population receives remittances on a regular basis (CEPAL, 2004; Mesa-Lago, 2005), and the majority of these funds are used for consumption (González- Corzo, 2006), it is possible that as a result of recent monetary changes and price increases at the farmers’ markets and the “dollar stores” the influx of remittances has increased rather than decreased. 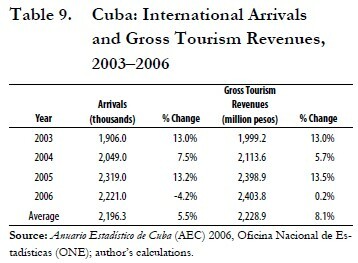 In the case of tourism, it is worth noting that at the onset of the monetary changes introduced in 2003, the Cuban leadership did not expect these measures to negatively affect tourism because the majority of visitors came from the Eurozone and other non-U.S. dollar regions such as Canada, Latin America, and the Caribbean. However, a brief review of recent tourism indicators reveals that there has been a notable deceleration in this vital sector of the economy since 2003. While the recent slowdown of Cuba’s tourism sector should not be entirely attributed to recent monetary changes, there is a possibility that some visitors from the top emitting countries (e.g., Canada, Italy, Spain, etc.) may be substituting Cuba’s version of “sun and sand” tourism with relatively cheaper alternatives such as the Dominican Republic. Table 9 presents the basic indicators of the tourism sector during the 2003–2006 period. 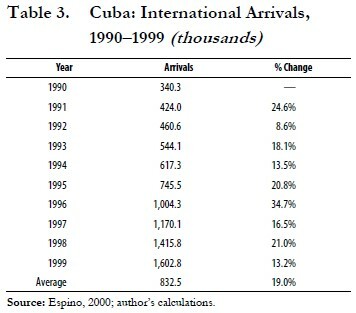 As the table indicates, after growing 7.5% in 2004 and 13.2% in 2005, international arrivals decreased 4.2% in 2006. 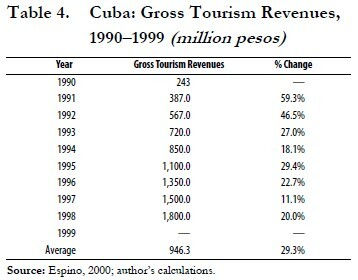 Similarly, after experiencing a gradual recovery during the 2003–2005 period, gross tourism revenues decreased notably in 2006. In the 1990s, Cuba implemented a series of reform measures to attract and increase remittances from abroad. These measures included efforts to attract foreign investment, the expansion of international tourism, the authorization of some limited forms of self-employment, the legalization of the U.S. dollar, the reorganization of the agricultural sector, the expansion of the national network of retail “dollar stores,” and the modernization and transformation of the banking and financial sectors. The need for modernization and improved efficiency were officially cited as the principal reasons for the transformation of Cuba’s banking and financial sectors during the 1990s, and the monetary policy changes that followed. However, given the high levels of external dependency of the Cuban economy, and the growing importance of remittances, these policy measures were (apparently) also motivated by the need to attract remittances from abroad. As a result of these policies, remittances increased significantly during the 1990s. 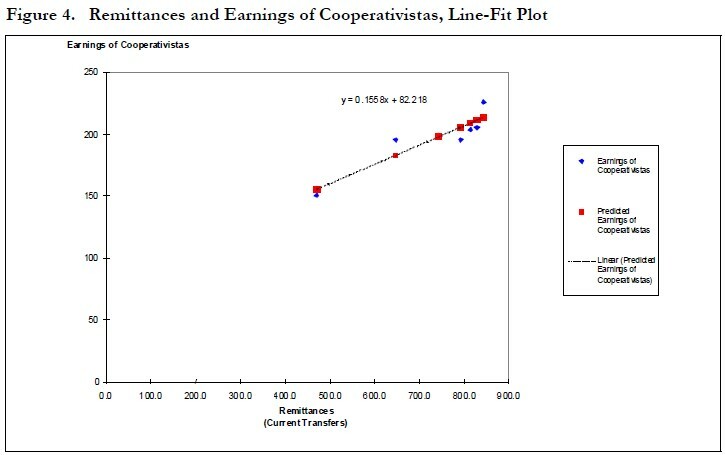 To analyze the effects of remittances on select areas of the Cuban economy, I conducted several one-variable, linear, regressions. The results revealed that remittances had a statistically significant effect on just three out of nine independent variables included in this study. All three were directly related to consumption, suggesting strong linkages between remittances and household consumption. 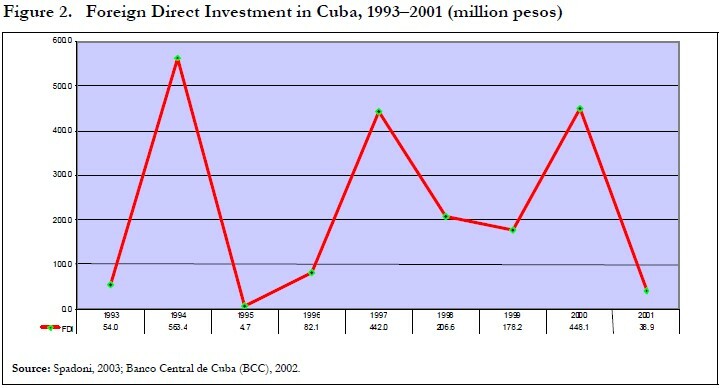 Despite Cuba’s initial success in attracting remittances, and their positive effect on household consumption, the monetary policies of the 1990s were reversed in 2003, as the Cuban leadership embarked on a reinvigorated “recentralization campaign” reminiscent of the 1986 “Rectification Process” (Mesa-Lago, 2005; Pérez-López, 2006). Once again, external factors (e.g., increased U.S. hostility, the “risks” associated with holding large reserves of U.S. dollars) and political considerations (e.g., the need to restore “monetary sovereignty,” eliminate monetary dualism, and reduce the inequalities caused by “dollarization”) were used to rationalize or justify recent changes in monetary and foreign exchange policy. Starting in 2003, Cuba began to gradually reverse its previous attempts to adopt quasi-official “dollarization” by recentralizing all foreign exchange operations, replacing the U.S. dollar with the convertible peso, and limiting the U.S. currency’s circulation. This time, however, success seems to be less certain, and there are some indications that a change of course may soon be underway. 1. Some of these factors included U.S remittance and travel restrictions (2004), and fines against U.S. based financial institutions that violated the embargo by transacting directly with Cuba (2005). 2. From the Cuban perspective, the recent monetary changes were also motivated by political considerations such as the need to regain “monetary sovereignty” and reduce the inequalities caused by “dollarization” (or monetary dualism). See “Resolución No. 80” (2004) for more details. 3. According to Ritter (2004a), Cuba’s external debt grew 57.1% from $7 billion in 1990 to $11 billion in 2000. The country’s external debt as a share of exports grew from 118% in 1990 to 229% in 2000. 4. According to the BCC (2007), short- and medium-term deposits are defined as instruments with maturities of 36 months or less, while long-term instruments normally consist of instruments with longer maturities. 5. Given the role of the State in the Cuban economy, and its socialist nature, the monetary aggregates monitored by the Central Bank consist of currency in the hands of the population, and savings held in the banking system, while the country’s monetary base is comprised of currency in circulation and official bank reserves (BCC, 2007). 6. According to Mesa-Lago (2007), this figure decreased 41%, to 236 joint ventures, in 2006. 7. Total arrivals is an aggregate indicator, which shows the total number of persons/individuals (from abroad) entering the national territory. While useful as a general metric, total arrivals overstate the actual figures for international tourists since it also includes residents/ citizens returning from temporary trips abroad. 8. Gross tourism revenues (or receipts) overstate the sector’s profitability because it ignores the cost of imported goods and inputs, as well as the share of net income (or profits) that is allocated (or distributed) to foreign partners and investors. 9. See Alvarez (2004) for a detailed account of the agricultural transformations of the 1990s. 10. For a detailed account of recent U.S. travel and remittances restrictions to Cuba Office of Foreign Assets Control (OFAC) (2004).